Elaine Hancock (Olney, United States) on 7 October 2014 in Miscellaneous. Love how the killing order comes from 'customer service' ! A most unusual sign. Some information about the damage caused by this fish may attract more attention. This happened to us in the UK with a fish called the Zander, attacked all our native fish. Et oui !!! de nombreuse espèces ( animal ou plantes ) invasives causent des problèmes !!! And yes !!! of numerous species (animal or plant) Invasive cause problems !!! But is it edible, and why not just bonk it on the head? Aw!! Predators should be eliminated I suppose !!! I wonder how this dangerous fellow surfaced here from the China Seas !!!! Ah, same situation in Japan. Fun shot. Happy Silly Tuesday! A serious problem difficult to resolve. An title appropriate and funny ... but .. it's a serious problem. 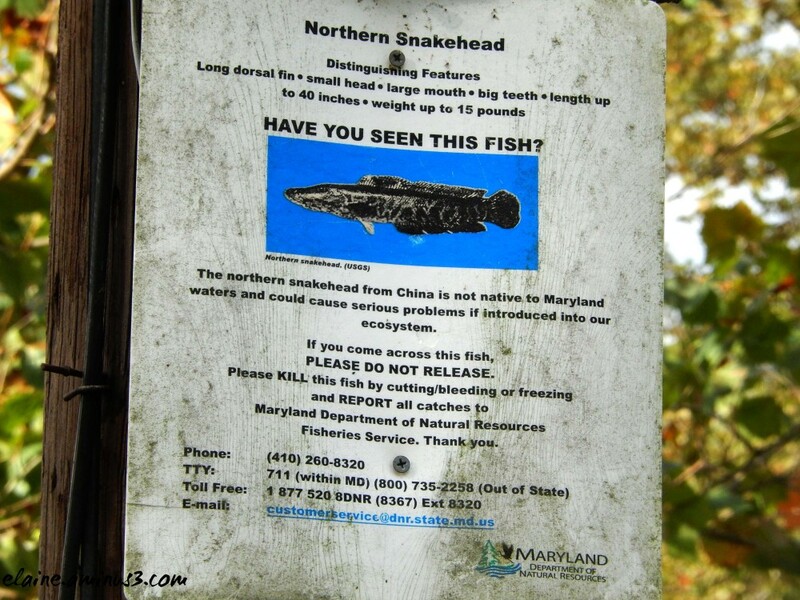 I hope they are able to contain this invasive fish and keep out of their waters. Maybe silly, but definitely kind of scary! Great capture, Happy ST ! Special sign ...Happy ST ! A cute capture!! I remember seeing these posted for the Asian carp that has been found in Lake Michigan. It's odd to see fish that can jump two or three feet out of the water. Scarey looking fish. Is this a joke for Silly Tuesday? or for real? @LauraS: No, unfortunately this is for real. This species has invaded the Potomac River and it's tributaries. Certainly thought provoking .. high impact image ..!